You can take interior modelling as far as you want. Often it's better to get the architectural details right first rather then the interior furnishings. They will set the tone for the whole interior anyway. Doors play a big part in the architectural detailing. We've shown a selection for doors below for ideas - they can be reproduced as is or you can take elements from them for a new design. 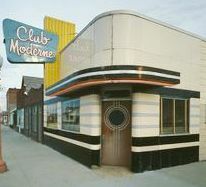 Top LH; Typical front door to a Streamline Moderne bar, with Porthole window. 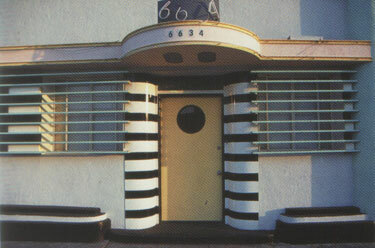 Top RH; Exactly the same thing with this door to a Streamline Moderne house. 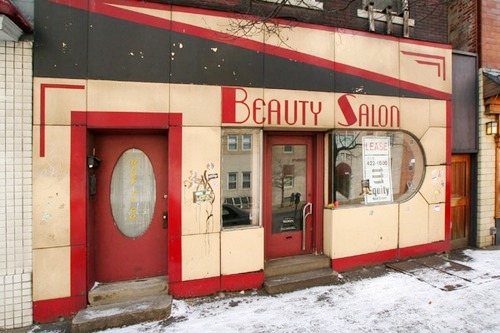 Mid LH; This great Streamline Moderne shop front is let down a bit by the very average original doors. While they match in colour the exterior they are nothing special in design terms. Mid RH; These double doors have a bit more going for them in design terms. The geometric round window & long double bar handles say deco straight away. The red edging around the window to emphasis it was a nice touch. 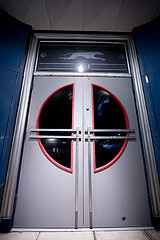 Bot LH; Portholes in doors were a key design feature in doors, especially in the Streamline style. 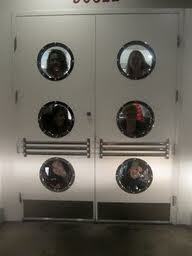 These diner doors have taken as far as it can go with 3 portholes per door! 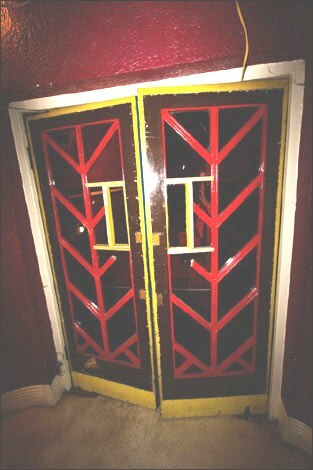 Bot RH; This is a stunnist Deco door, a mix of Cubist & Abstract, it looks almost like a Modernist painting. The half porthole is an interesting take on this look. 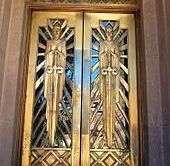 2 of my favourite Art Deco door designs. 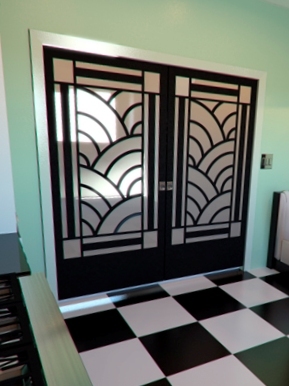 Its a clever designer's trick to add a wow Deco feature, such as these doors, to take you eye away from an interior or exterior that is not that Deco. For eg, you could have these double doors in a plain kitchen, but the doors will set the whole tone for the room. The red front door is just to die for, almost an abstract painting. Tor LH; new(ish) double doors. 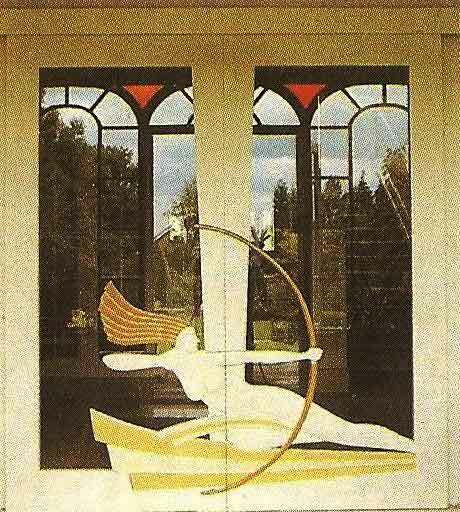 They feature the common Deco design of Diana hunting. 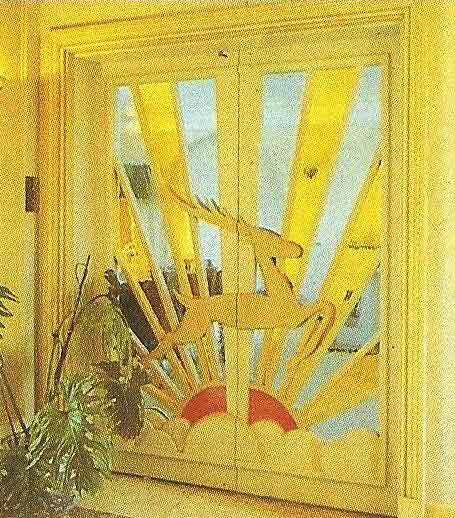 Top RH; new9ish) double interior doors, featuring another common Deco theme of Acteon the Deer, with a rising sun motif behind in stained glass. Bot LH; another pair of doors with deer design & rising sun motif behind. Bot RH; We're not suggesting you reproduce these doors excatly, but if you left out the central figures the doors have a straight forward Deco look. Top LH: doors from the Hoover building in London. The geometric design would be quite easy to reproduce. 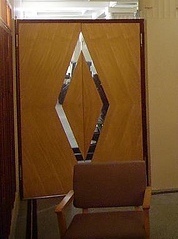 Top RH; Another pair of doors with simple geometric banding on the glass. Easy to do. 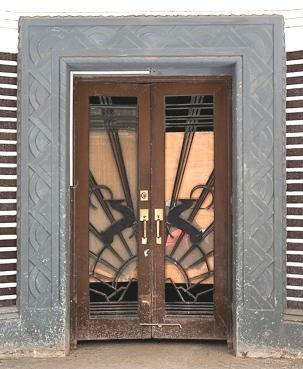 Bot LH; These doors were in a 30's cinema in the UK. Similar to the ones shown top right. Bot RH; This huge solid door looks almost medieval. The geometric veneers & diamond window give it a strong Deco look. 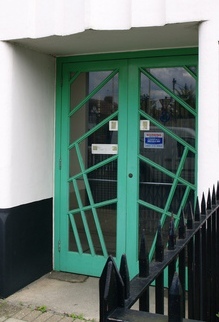 Tor LH; These double doors came from a 30's London building. The chrome 'diamond' makes a strong geometric statement, which is echoed in the subtler effect of quartered veneering, which follows the shape of the chrome, giving it a Cubist feel. Top RH; These new(ish) bedroom wardrobe doors use strong geomtric patterns with mirrored panels, to give a real glamour feel to the room. The inspiration came from the doors above, but softened for a bedroom. 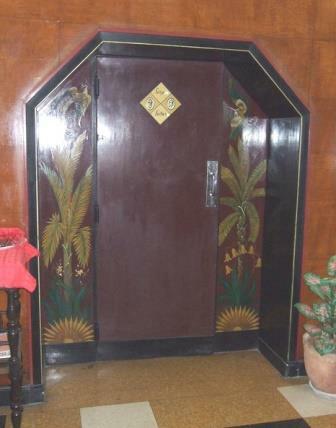 Bot LH; What a great Deco doorway with Wow factor. The geometric opening meant placing 1 single wide door in the middle, flanked by a panel either side. The door itself is quite plain, but the angled sides & painted panels give it a strong Deco flavour. 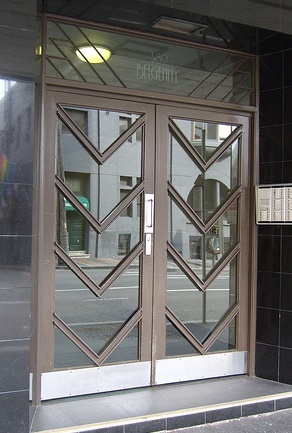 Bot RH; A very simple to achieve Deco front door. The top glass panel has angled corners to jazz it up a little. The 3 bar handles are superflous but do give it a streamline look.